Volleyball is quickly growing its local fanbase by the day. More and more Filipinos are watching the sport via semi pro leagues like the Philippine Super Liga, as well as supporting the national team. Credit that to the importance given to the collegiate level of competition, which allowed the likes of Rachel Anne Daquis, Mika Reyes, and Alyssa Valdez to gain immense popularity. While there's no doubt that basketball is still lording over TV sets and barbershops, the volleyball community is quietly taking over social media, particularly Twitter and Instagram. As proof of its burgeoning online influence, FHM gives you the most-followed volleybelles of UAAP Season 80, before the second round gets underway tomorrow. First off all, we would like to apologize for having ommitted the 6'2" outside hitter from our list of tantalizing towers. Surely that won't happen again after this. Overshadowed by her impressive two-way play is the reigning Most Valuable Player's kikay side, which is very much evident in her feed. Baron is making good use of being built like a model, looking fine both on the court and catwalk. Cheng made a name for herself following her MVP performance in last year's Finals. With that natural glow, infectious smile, and effervescent charm, it's no wonder Kib Montalbo and 99,999 other people fell for her almost instantly. Replacing a player of the Queen Eagle's caliber in the starting lineup is no easy task. But the third-year setter embraced the challenge and has filled in admirably for the phenom. Ateneo's team captain is the total package. Madayag has the grace, height, and skill to be one of the country's most recognized volleybelles. If not for that setback in 2016, the middle blocker's rise to prominence could've come sooner. You're missing out on a lot if you're still not following this short-haired stunner. Ponggay has been a personal favorite since we've laid eyes on her. Reward yourself by following her on Instagram and turning the push notifications on. Based on her uploads, Santiago is the personifiation of the expression "legs for days." The only better thing to do than witnessing the imposing totem pole dominate opposing teams is double-tapping her fashion and beach snaps. Search the outside hitter's name on YouTube and what you'll find are highlights of her Top 10 attacks and monster spikes. It's the opposite on IG—see a beaming Maraguinot, who doesn't look like she could kill you with a single smash. What we would give to meet Dy in person. She just exudes that aura of sophistication and professionalism, even while sweating buckets and blocking like crazy in a game. Good thing we have her posts as a nice consolation. Called it last season! 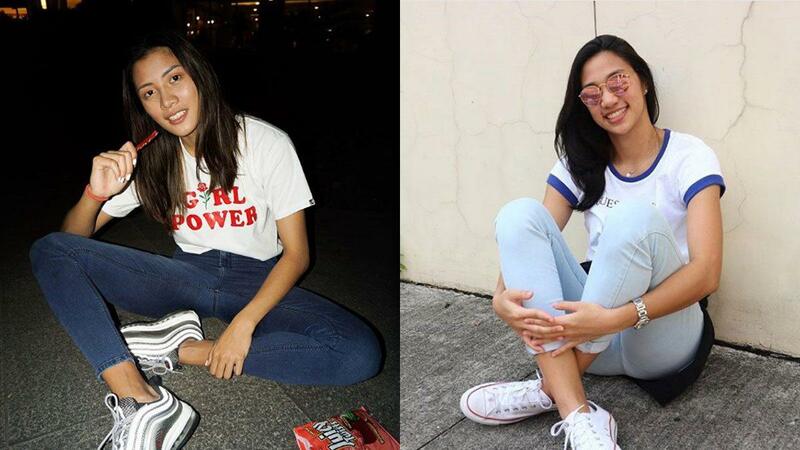 De Leon definitely has some Mika Reyes vibes. The 5'11" middle blocker is slowly emerging as one of her squad's leaders, especially whenever facing rival La Salle.